The World Science Fiction Convention will return to Texas for the first time since 1997 after voting results announced Aug. 20 at Renovation, the 2011 Worldcon, awarded the right to host the international conference to the Texas in 2013 bid. 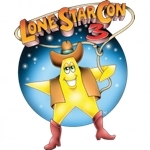 LoneStarCon 3–the 71st World Science Fiction Convention–will be held Aug. 29-Sept. 2, 2013, at the Henry B. Gonzalez Convention Center in San Antonio, Texas. The Mariott Rivercenter and Mariott Riverwalk will serve as the host hotels. LoneStarCon 3 is sponsored by ALAMO, Inc., (Alamo Literary Arts Maintenance Organization), a 501(c)3 organization. Membership for LoneStarCon 3 may be purchased at www.LoneStarCon3.org. In addition to individual memberships , LoneStarCon 3 will also offer a family rate. For more information about LoneStarCon 3, memberships or hotel information, visit www.LoneStarCon3.org.